You read my mind with the color changing info! I am currently learning how to add pictures to my bags and stuff i crochet. Right now i am working on a bag with a skull and crossbones on the front. Its just sc, so should be easy enough. Thanks again, your pics and info really helped! I know I’ve been coming here for awhile now but it never fails to amaze me that you show this for both rights and lefts. You’re amazing! I’ll be linking. Thank you so much for this info! I am currently making a hat for my son and was wondering how to do this without tying the colors together. Are we to crochet over the dropped yarn? I always feel like it will unravel, so I sometimes tie the two yarns. 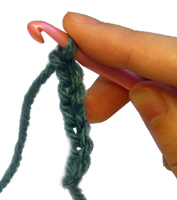 Yes, I know it’s a big no no, but as I said, I just feel insecure about dropping and picking up yarn without a slip knot or pulling (dropped yarn) through. 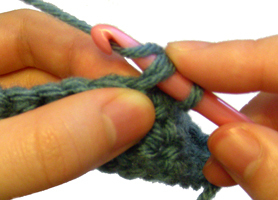 Sometimes it’s good to crochet over the dropped yarn, as some like to call it “carrying” the yarn in the work. If you choose not to, you can always weave the end of the yarn into the back of your work when you are done or you can tie the two pieces together. Do what seems right for you. I don’t think there is any wrong or right way of doing it. Thanks for your quick reply, Rachel. I will play around with my practice yarn. Miss Rachel I Love all your Crochet Stich . THANKS!!!!!!!!! Ramona. oh that makes sense to me now. I have a crochet book but your instructins are so much better. Thanks for this. I looked right over it the first time! 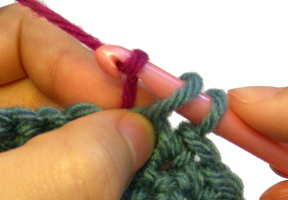 You should switch colors in the last stitch of your row. You can either cut your yarn or carry it in your work, your choice. I’m still a bit confused about carrying yarn as you change colors. I am trying to crochet the piano key scarf and every time I attempt to crochet the black into the white and carry the white with me, the keys end up looking black and white instead of just black. Am I doing this wrong or what? Is this a tip that is used only in special cases, and is so, what would those cases be? And if I do not carry the white yarn with me as I crochet the keys, do you have another way to switch back and forth between white and black? Do I need to just cut the yarn and reincorporate the colors back into the scarf? I am really wanting to figure this out and any help would be great. Hi Sarah, the piano key scarf pattern will tell you when to carry each color and when to not carry it. This will prevent your blank keys from looking write. Please read the pattern carefully. So, after changing the colors, do I just weave in the loose ends after that row? Also, which is better, to carry the yarn or not? Hi Sherrie, yes you just weave in the loose ends after you change your colors. You can carry your yarn, but it would depend on your project/pattern. Sometimes when you carry it will make your work too bulky and the different colors will show though. But other times it’ll work fine and is very convenient. 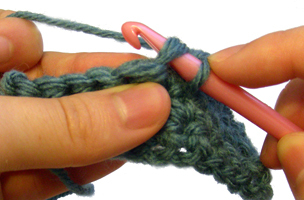 The more you crochet, you’ll find out what works for you. When in doubt just weave them in when you’re done. 1st question- when carrying yarn, doesn’t it make the sts bulkier? 2ns question- doesn’t the carried color show through the new color? Hi Kamama, when you carry yarn it does make your work bulkier. For your second question, it depends on the yarn colors, some will show through and some won’t. Try it out! Fay, after you change your colors, simply weave your old color into your work. Or you can carry the old color in your work as shown at the bottom of this tutorial. Thank you so much, I am a beginner and this was very helpful. Hi, when you change colors, what do you do with your old color, do you tie it off, or what. Or do weave the end into your item your working on. hi rachel, hope you can help. i’m in the process of crocheting a baby afghan with the name in it. i’m having trouble with picking up colors. sometimes i have to pick up the different color after 2 rows, depending on the graph, but the back side looks terrible because now my yarn is going over the main color before being picked up again in the next row. how can i make this look better? Hi Dawn, if your unused color shows through, I wouldn’t carry it in your work. 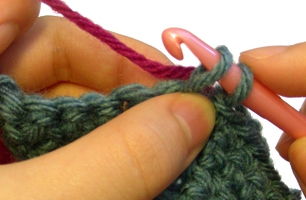 Carrying yarn is great when your stitches are tight and hides the unused yarn. Instead, you can cut the yarn and start it again where you need it. Or you can use multiple balls of the same color, depending on your graph. I have been puzzled as to how to change colors within a row…and I’m still confused. I am trying to crochet a cancer ribbon dish cloth and I tried to “carry” the colors, which the pink really stood out. I tried to end by cutting the MC to attach the CC…but that looked ridiculous. Row 38: 11 sts in crayon color, 4 sts in charcoal, 11 sts in crayon color. Row 39: 10 sts in crayon color, 6 sts in charcoal, 10 sts in crayon color. Row 40: 9 sts in crayon color, 8 sts in charcoal, 9 sts in crayon color. Row 41-42: 8 sts in crayon color, 10 sts in charcoal, 8 sts in crayon color. Row 43-44: 7 sts in crayon color, 12 sts in charcoal, 7 sts in crayon color. Could you please help me to understand when and where and how I change the color. I’m very new to crocheting. Thank you in advance for your help!! 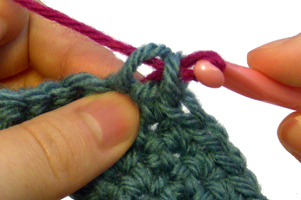 Hi Terry, I’m not sure what stitches you are using, but if you look at the part of the tutorial under “Changing Colors in Crochet Stitches” it shows you how to change the color of the yarn at the end of a stitch. 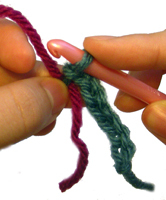 You would drop the yarn you are using and pick up the new color to complete your stitch. 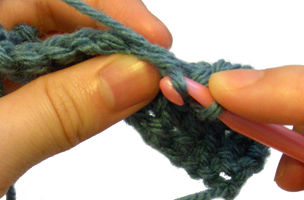 You can use this method for single crochet (as it’s shown in the photos) or double crochet, etc. 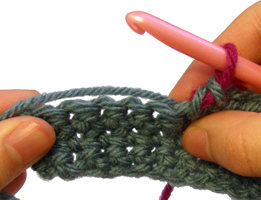 For example, in row 38 of your pattern, you would change the color to charcoal on the last step of your 11th stitch. You would change to your crayon color during the last step of your 4th charcoal stitch. I’m using a half double crochet..
Do I change at step 5? If so, it looks right at the end of the oval, but not at the begining of the oval. I have to be doing something wrong, but I can’t figure out what it is. Am I doing the hdc wrong? Thank you so much for your help!! That sounds correct Terry. Why doesn’t it look right at the beginning? What does it look like? I tore it out again, for the 10th time (or more). I’m going to try again from row one. When I get to the oval, if I can’t get it to work, I’ll send you a picture of it, if that’s ok.
Changing colors has always been a problem for me. Thanks for the great tutorial. Thank you for the helpful tips! How would I change color at the edge of my work? The same way? I usually knot them together, but I dont think that looks very well. Hi Emilie, yes you would change colors the same way. You can tie a knot if you’d like, but you don’t need one. 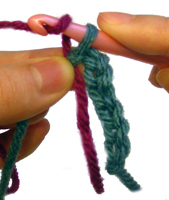 Weaving your yarn ends into your work when you’re done should be enough to secure the yarn. I understand the directions now for working over yarn when using two colors, will there be a “wrong side” then? If so I’m confused because the directions states at end of row, turn, and continue pattern. If i”m not mistaken when you turn, i”ll be working “right ” side on “wrong” side, right??? Thank you for the visual! I am a very visual learner and your photos have helped tremendously! Please keep up the excellent work. Thank you for the left handed views!!! If I change colors this way, can I cut it after that or do I have to carry it? I am making a ripple aphgan 2 rows of each color. Hi Stephanie, you can either cut the yarn or carry it. It’s your choice! Feel free to try doing it both way to figure out which method you prefer. i HAVE TRIED OT USE TWO COLORS WHEN CROCHETING A DESIGN..BUT ONE COLOR ISALWAYS PROMINENT AND IT SHOULDN’T BE…hOW DO YOU CHANGE COLORS IN THE MIDDLE OF A ROW WITHOUT THE FIRST YARN SHOWING? i CAN’T FIND INFO ON THIS.. I prefer cutting, especially if you are going to do several rows with the new color. Carrying it would waste a lot of yarn, something I really can’t afford to do. Plus it can make it look thicker where you carried it, and depending on the thickness of the yarn you are using, that could be an issue. It isn’t much of an issue with bulky yarn, but with very thin baby yarn, it really does show, even the little bit that you have to carry when you change colors. Just one old crocheter’s opinion, though, YMMV (you milage may vary). Once you change colors, what do you do to secure the strand left from previous color? Cant that accidentally get pulled and release the previous stiches? Hi Lydia, you can weave the ends into the work. Most of the time that’s enough to secure the yarn into place. But if you’re afraid that it’s not enough you can tie a small knot then weave your ends into the work. I am thinking of making a blanket using the pattern for the Crochet Blue Ridge Throw from the Lion Website. 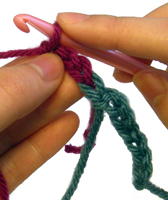 In the pattern, you use 2 colors-two rows of each, back and forth with the colors. I have never done anything like this before. Your advice in how to change colors is very helpful. I have tried to find something to help me figure out how to change colors. But I am still sort of puzzled about something. You showed how to carry the yarn along a row. What I am wondering about is, can you carry the yarn up the side (end) instead of the rows, or is it best to just cut it off each time? If it is possible, then how. I would appreciate any thoughts or comments you may have. Thank You! Hi Penny, you can bring the yarn up along the side, but it would show. It would probably be better just to cut the yarn each time.